Currently there is some confusion in terminology when Aquaponic practioneers discuss variations of horizontal and vertical systems. There are vertical towers and there are horizontal rails/tubes/channels; some horizontal set-ups are designed in a vertical or stair-step configuration. You may choose to follow a particular Aquaponic Gardener step-by-step or take an idea from one and add it to another’s practice for your own project. There is a great deal to be learned and understood from the commercial, larger operations and the ready-made kit providers as well. The following are informative videos about horizontal set-ups. Good Luck! Read the comments on each video for more information. Additional videos by each producer/contributor may be of value to you. Howto Build PVC Hydroponic System - Complete Parts List * 5:37 mins. From BrownsABQ - Complete plans and Parts list to build your own NFT PVC Hydroponic System for about $50. Note: Use of screening instead of Grow Pots. This set-up could be converted to Aquaponics by replacing Hydroponic chemicals with ornamental or edible fish. Aquaponics system for under $200 * Pete Jones * 3:45 mins. Home Aquaponics- Building a new system* Kudaimo * 3:11 mins. How We Built Our Aquaponic System - Mom's DIY * 7:45 mins. Vertical Earth Garden's client installation * 0:58 seconds.Clever functional set-up. Hydro Not AQ, but the design is worth consideration. Note: the wheels. Aquaponics update 4-07-2011 * richlyn71 * 4:18 mins. Aquaponia * odair rogerio Jesus * 2:54 mins. Brazilian? Beautiful set-up in a very small space. 15 plant pot placements per pipe times 4 = 60 plants. DIY Hydroponcs for $300 * craigarious * 4:41 mins. 70 plant unit from scratch in one day. Supplies food all year. Note: Another Hydro set-up convertable to AQ. Homemade A-Frame * greenerways * 6:10 mins. System sits on a 6' x 10' foot print, holds 168 plants & can be easily moved, expanded or transported. Aquaponics Cosa Rica * Osa Mountain Village* 1:24 mins. Note: A-frame rails similiar to greenerways set-up above. Basement hydro system 1 * lakebound09 * 9:37 mins. Shows 3 different systems, 4, 3 and 2 inch rails. Note: cups instead of pots. This set-up could be converted to Aquaponics by replacing Hydroponic chemicals with ornamental or eatable fish. Included to show abundant results on massive scale. Note: cups not caps on one end of slanted pipes. Note: Read lengthy description. Hydroponic Greenhouse * 3:13 mins. Another Hydro system easily converted to AQ. Note: The seed starting rail close-up near the end of the video. 4-Tier StrawberryPlanter using waterpipe Part 1 * 5:26 mins. Planter system using 90mm storm-drain water pipe (inexpensive) hanging from greenhouse ceiling. It is basically a fill and drain hydroponic system but growing in soil. Watering from a tank via gravity drip system, overflowing into a vegi bed. No pest problem and very clean strawberries. Note: Strapping vs. other framework. How to Build a Hydroponic Garden 1:52 mins. My first outdoor hydroponic grow. The plants were just planted. This system can easily grow about 24 plants which means fresh veggies all year, hundreds of tomatoes and lots of fun! See: awesomenessproject's follow-up - Homemade Hydroponic System 3 Months Later - "My first outdoor hydroponic grow. Everything grew bigger in this thing compare to the plants in the dirt." Note: easily converted to Aquaponics. If you don't want to give up a soil-based system for some plants here are 3 considerations. 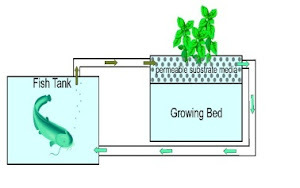 Could aquaponic media be substituted for the soil in these set-ups? Growing Vegetables in Rain Gutters -Seed to Harvest * 9:53 mins. Gardener Greg and Florafarmer Fred show progress of their 4" vermicompost soil based system. Note: Use of heat tape in bottom of gutters. Consider using fish waste drip system? Non-AQ? Yes. Worth consideration? Yes. Build The Self Watering Rain Gutter Grow System! * 15:22 mins. Larry Hall has a good number of videos on his system. Good guy! Note: Convert to Aquaponic watering? AQ media? Gutter Garden * Lowes * 1:59 mins.